DPG Series Pneumatic Gripper is a parallel 2-jaw gripper with excellent parallelism and accuracy between the gripper mounting surface and jaw surface. Jaws can be mounted on the bottom or side and are supported throughout the length of the body to make this gripper an extremely robust, yet compact, design. They are also available with optional spring assist ("-C" option) on the close stroke to prevent the part from being dropped in case there is a loss of air pressure. They are available in stroke lengths from 6.4 to 25.4 mm (0.25" to 1.00") with a gripper force of 222 N (50 lbs). 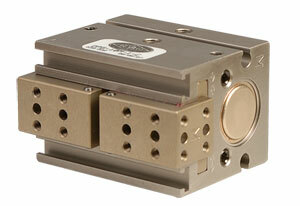 The DPG pneumatic gripper shielded design allows this gripper to be used in harsh environments.